1) What type of plan would be best for my practice? How do I know whether I need a SIMPLE IRA, 401k or a Cash Balance plan? Whether a particular plan is the best choice for your business will depend on multiple factors, and a thorough analysis should be done prior to recommending a particular type of plan, including an illustration that shows your potential contribution and the employer contribution you will need to make for your staff, and side by side cost vs. benefit analysis for different plan options. For a group practice plan, we will also need to include information about contribution preferences of each partner so that a plan can be designed to allow each partner to customize their contribution amounts. 2) I’m trying to decide on whether a 401(k) or a SIMPLE IRA would be a better plan for my business. Can you help? In short, those who can make the higher contributions ($54k for individuals and ~$75k for owner and spouse) can benefit from using a 401(k) with profit sharing vs. SIMPLE, provided practice demographics is favorable and a cost-effective plan design can be utilized. 3) How does a 401(k) with profit sharing work? Often, plan demographics have a significant impact on the employer contribution for smaller plans, especially when the owner is younger than the staff. Larger plans with more non-highly compensated employees might benefit from customized cross-tested plan designs that can allow the owners to maximize their contribution while minimizing employer contribution. 4) Would a pooled 401(k) plan or a participant-directed plan work better for my practice? We typically recommend that solo practices start with a pooled 401(k) plan, while practices with many partners and/or savvy staff who have experience with 401(k) plans might want to use participant-directed plans. We also recommend that mature practices with pooled plans might want to switch to a participant-directed plan especially if there is significant interest on behalf of partners and/or staff of such practices to direct their own investments. 5) What providers do I need to hire to for a 401k plan? For a Cash Balance plan? Open architecture vs. bundled plan providers: When all of the plan’s services are offered as part of a bundle (and especially when you have no control over selection and replacement of plan providers and services) this is typically known as a bundled plan. On the other hand, open architecture refers to a plan where the best providers are selected to work together to build a custom-designed plan. This is often a lot less expensive because bundled providers are compensated via asset-based fees, while open architecture providers who are compensated exclusively via flat/fixed fees can be selected to provide the same or better services. Third Party Administrator (TPA). TPAs provide administrative and compliance services and they are also responsible for generating optimal designs for 401(k) with profit sharing plans. For a combo 401k/Cash Balance plan a single TPA would be responsible for managing both plans. While there are both large and small TPA firms, it is preferable to hire a specific person (rather than a firm) who has superior knowledge and experience. Smaller firms often provide better quality service vs. large ones, and it is always better to have access to a dedicated TPA that works just for you. Actuary. Actuaries provides services to the Defined Benefit and Cash Balance plans, and it is recommended that a knowledgeable actuary is used for best results, since Cash Balance plans are significantly more complex than the 401(k) plans. It is best to hire independent actuaries to work under the supervision of the TPA. Record-keeper. This is typically a large plan provider that offers an online portal that allows access to individual plan accounts, tracks plan contributions and transactions. Many record-keepers offer very basic TPA services (including plan document creation and plan administration in addition to record-keeping). However, record-keepers are not known for quality plan design services because they have thousands of clients, so plans that require specialty designs (such as 401k with profit sharing and Cash Balance plans) should hire an independent TPA. Some record-keepers don’t offer any plan administrative services at all, and are known as ‘record-keeper only’ platforms, while full service record-keepers sometimes offer unbundled ‘record-keeper only’ platforms where just the record-keeping services are provided. Record-keepers do not provide compliance services (and those who offer such services typically use automated platforms, which cannot replace actual human oversight). Record-keepers are often integrated with a custodian, where the assets are actually held. Because Cash Balance plan is a pooled plan with all of the investments commingled, a single-participant account is opened at a record-keeper. This is similar to a pooled 401(k) plan, where a single-participant account is also used. A good ERISA 3(38) will be looking out for your best interest, including finding ways to minimize plan services cost, providing access to low cost investments and overseeing your plan’s fiduciary process. For Cash Balance plans, the ERISA 3(38) fiduciary takes on a discretionary role. Cash Balance plans have unique risks associated with them, so an ERISA 3(38) should consider such risks when designing an investment strategy for a Cash Balance plan. ERISA attorney. Because retirement plans are subject to ERISA law, ERISA attorneys that have specific expertise in retirement plans often assist with various retirement plan issues. When selecting one, always make sure that they are an expert on retirement plans. These attorneys deal with issues such as controlled/affiliated groups, making sure that you are not breaking any laws while operating your plan (especially if your plan has individual brokerage accounts), and compliance with the plan document provisions among others. When absolutely necessary, we refer our clients to the best ERISA attorneys, because it is better to take action proactively and to fix any outstanding issues that they don’t compound going forward than to end up paying significantly more after an IRS or DOL audit. 6) How do I find the best providers for my retirement plan? A ‘bundled’ provider might typically include all of the necessary components, but the quality and cost of such services is typically significantly inferior to what you can get by using ‘open architecture’ providers. The best arrangement is to have an open architecture record-keeper, an independent TPA and an ERISA 3(38) fiduciary, all of whom work exclusively for you. Each provider has to be independent from one another, and only this approach would ensure that you are getting the best service at the lowest possible cost. 7) How do I know what fees I’m paying for my plan? Revenue sharing. These fees are paid by mutual funds to the advisers and/or record-keepers who selected these funds for the plan investment lineup. Often, multiple providers are paid this way. Revenue sharing fees can be as high as 1%. Ideally all of the revenue sharing should be credited towards the cost of administrative service fees, but that does not always happen. If revenue sharing fees happen to be higher than the cost of administration in that case the revenue sharing fees are only partially credited to the plan. In order to pay revenue sharing, fund expense ratios need to be significantly above what they should be (as compared to those charged by index funds which pay no revenue sharing). 12b1 fees. These are typically paid by the mutual funds to the advisers who sell the funds to the plan. Not all funds charge 12b1 fees, but those that do often have higher expense ratios than that of index funds. These fees are usually around 0.5% or less. Administrative/record-keeping fees. It is not uncommon to see 1% and higher administrative and record-keeping fees for smaller plans. Advisory fees. Typically range from 0.5% to 1% for most plans. 8) How do I know whether my plan has any fiduciary, compliance or administrative issues? Not all providers have the expertise to discover and address complex retirement plan issues. It often takes three different professionals to do a comprehensive plan review that examines administrative, fiduciary and compliance issues: a TPA, an ERISA 3(38) fiduciary and an ERISA attorney. It is always a good idea to have an independent third party review of your plan, especially if your current providers haven’t kept up with all of the plan’s issues and potential problems. 9) My plan has brokerage windows (or SDBAs – self-directed brokerage accounts) only and no fund menu, is this a good arrangement? In short, no, especially if you have non-highly compensated (NHCE) staff. ERISA requirements for participant-directed plans are not satisfied with SDBA only plans, and there are significant fiduciary and compliance issues that have to be addressed. It is always better to set up a plan that has a fund menu and managed portfolios, and if HCEs want to invest their assets in an SDBA, this can be arranged as part of the plan, and this can be done cost-effectively and with full ERISA compliance. 10) How can our plan decrease the fees we are paying to our providers? Aside from removing all asset-based fees and replacing all providers with those who charge fixed fees it is important to hire an independent ERISA 3(38) fiduciary and a Third Party Administrator who is independent of the record-keeper. It is also important to look at the entire plan holistically and to make sure that all parts are working properly to avoid any potential fiduciary and compliance issues in the future. 11) What are plan sponsor fiduciary obligations under ERISA? The duty to act prudently is one of a fiduciary’s central responsibilities under ERISA, requiring expertise in a variety of areas, such as investments. Diversification – another key fiduciary duty – helps to minimize the risk of large investment losses to the plan. Fiduciaries should consider each plan investment as part of the plan’s entire portfolio. Fiduciaries will want to document their evaluation and investment decisions. Lacking that expertise, a fiduciary will want to hire someone with that professional knowledge to carry out the investment and other functions. Fiduciaries who do not follow the basic standards of conduct may be personally liable to restore any losses to the plan, or to restore any profits made through improper use of the plan’s assets resulting from their actions. Documenting the processes used to carry out fiduciary responsibilities is essential. Despite relief from liability for the specific investment allocations made by participants or automatic investments (404(c) and QDIA), the fiduciary retains the responsibility for selecting and monitoring the investment alternatives that are made available under the plan. Fiduciary can hire service providers to handle fiduciary functions. If an employer appoints an investment manager, the employer is responsible for the selection of the manager, but is not liable for the individual investment decisions of that manager. An employer is required to monitor the manager periodically to assure that it is handling the plan’s investments prudently and in accordance with the appointment. All plan fiduciaries have potential liability for the actions of their co-fiduciaries. Vendors for retirement plans usually do not accept full discretion and liability, so unless a vendor has accepted fiduciary liability in writing, plan sponsor is liable for the vendor’s fiduciary breaches. If a fiduciary knowingly participates in another fiduciary’s breach of responsibility, conceals the breach, or does not act to correct it, that fiduciary is liable as well. 12) What are the different types of retirement plan adviser fiduciaries that provide services to a retirement plan? ERISA 3(21) is a co-fiduciary with an advisory role. The plan sponsor retains full responsibility to monitor a 3(21) and is responsible for making final plan decisions. If you are looking for someone to take full responsibility for your retirement plan investment selection, portfolio management and participant education, an ERISA 3(21) is not enough. ERISA 3(38) (Investment Manager) is a discretionary fiduciary having full responsibility for selection of investments and management of model portfolios. An ERISA 3(38) can also assist plan sponsor with participant education and advice, and they would typically hire and/or oversee an ERISA 3(21) specifically selected to provide participant education and advice. Registered Investment Adviser (RIA), sometimes known as ‘financial advisers’, ‘financial planners’, etc. While ERISA 3(21) and 3(38) fiduciaries must be RIAs, an RIA is not an ERISA fiduciary, and when an RIA provides advice to a retirement plan without acknowledging their ERISA fiduciary status, they are not acting as an ERISA fiduciary, though the new fiduciary rule (enacted in 2017) might change this going forward. Still, there are many ‘advisers’ providing advice to retirement plans who might be fiduciaries under Advisor’s Act of 1940 (RIAs), but not under ERISA, and making that distinction is very important with respect to plan sponsor’s fiduciary liability. If your plan is served by any adviser (including brokers or any adviser who is not an RIA) who did not enter into an ERISA fiduciary arrangement with the plan sponsor, you are fully liable for the actions of this adviser, especially if they are selling products and getting paid via commission and generally not acting in the best interest of the plan participants. 13) I own/co-own multiple entities/practices/businesses. Can I have multiple retirement plans? It depends. The first requirement is that your income from an entity is earned vs. passive. Only earned income can be used for retirement plan purposes. As long as you don’t have a controlled group or an affiliated service group (ASG) you can have multiple plans for multiple streams of income. However, the rules of controlled/affiliated groups are complex, and mistakes are often made. To avoid having to pay significant fines and penalties it is always recommended that those with multiple entities get a thorough analysis done to make sure that all applicable laws are followed. Because medical and dental practice owners (unbeknownst to them) often end up with controlled or affiliated group arrangement, we always make sure that any potential issues are addressed and resolved cost-effectively. 14) What is your investment philosophy? Create a long term plan that addresses your entire financial situation. While this is listed last in the article, this is actually the starting point. Diversify across multiple asset classes. Proper asset class selection can provide the best way to get wide diversification. Use low cost index funds. There is no reason to use managed funds, most asset classes are represented by low cost index and/or passively managed funds. Minimize investment expenses. This includes both investment expenses and advisory expenses. Specifically, minimizing asset-based fees should be the #1 priority. Manage downside risk. Risk management is the key component of a long term ‘buy and hold’ portfolio, especially for those who are going to accumulate significant assets over time. 15) What do terms ‘equal weighted’, ‘1/N diversification’ and ‘barbell’ mean and how can these concepts be applied in practice? Because one never knows which asset class will do better in the future (and it is impossible to tell this from looking at the past history), to avoid making the wrong bet on a specific asset class (by weighting one more than the other) one can choose to equal-weight all of the asset classes in the portfolio. This way one does not pick winners and losers based on past history, but instead concentrates on having equal exposure to all asset classes, including blend and value, domestic and international, large and small, stocks and bonds. This is also a subset of what’s known as 1/N diversification where instead of concentrating narrowly, one is using as many individual investments (such as stocks) as possible weighted equally to gain the widest possible exposure to the markets. Using equal weights for all of the portfolio equity asset classes is just an extension of 1/N approach. This is why each asset class has to represent a specific index with (ideally) thousands of stocks in each asset class. With this approach, the actual volatility of your stock allocation will be significantly higher than that of S&P500 because of the exposure to highly volatile asset classes such as domestic and foreign small cap and emerging market stocks. The only way to manage risk is to set a floor for your portfolio. One way to do this efficiently is by using what’s known as a ‘barbell’, or a bi-modal asset allocation model. In practice, the barbell allocation is achieved with two halves: a relatively safe bond allocation and a highly speculative stock allocation, the equal-weighted 1/N allocation described above. The bonds are typically laddered and thus diversified across maturities, while the stock allocation provides a global market exposure via low cost index and passively managed funds with a beta that is significantly higher than that of S&P500. So when the markets crash, the bonds set the floor, and when the markets go up, the stock allocation goes up more than S&P. This type of investment approach works well both for individual accounts and for retirement plans because it is designed for those who are going to accumulate significant money in their portfolios, so the risk management becomes the dominant component rather than trying to maximize returns (which is anything but assured with higher stock allocation). 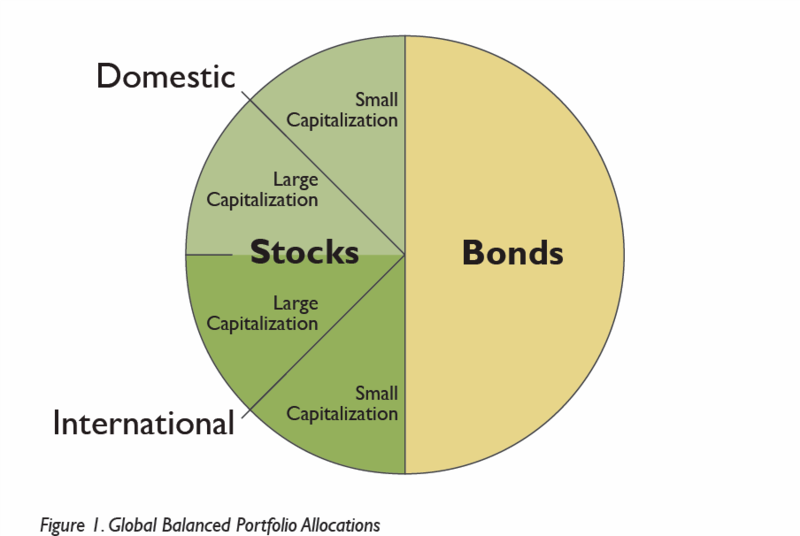 Figure 1 shows an example of a Global Balanced portfolio that is equal-weighted (on the stock side), wide 1/N diversification (via index funds in multiple asset classes), and a bi-modal stock/bond allocation (barbell). One key feature of the allocation in Figure 1 is significant exposure to small capitalization and value (or dividend-paying) stocks, which makes the stock component of this allocation extremely volatile, thus necessitating a higher bond allocation than for a typical large cap/bond portfolio.